Location of the soak or well where Warburton may have obtained water. A stone mortar and pestle found at the well site, one of a number of artifacts found here. Evidence of Aboriginal habitation at this remote location. Jol's expeditions to locate Waterloo Wells. One of 1873 explorer, Peter Warburton's, depots. Jol has long been fascinated by the accomplishments of early European Inland Australian explorers. He has researched and investigated many of their routes in the Center. Peter Warburton, using camels, left Alice Springs in 1873 to travel to the west coast. No European had previoulsy completed this traverse. The party only just made it but they did all survive. 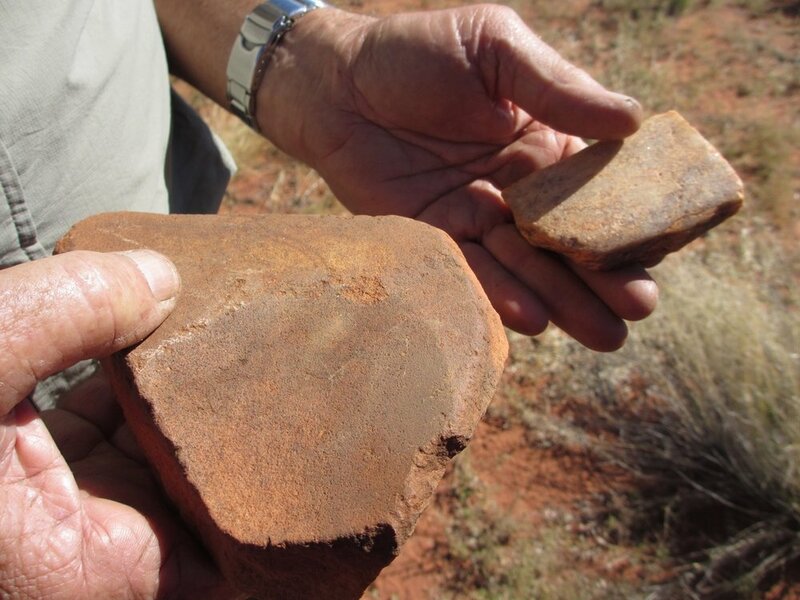 What history does not record is that most of the places Warburton's party obtained water were shallow wells which the Aborigines who had lived in this desert region had been using and maintaining for tens of thousands of years. In 2013, 2014 and 2015 Jol led trips north west of Vaughn Springs to retrace Warburton's route.